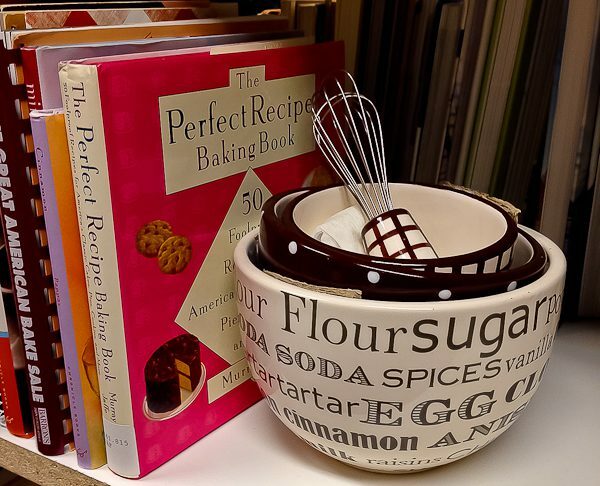 October is National Cookbook Month! You would think I should have known that seeing that I write a cookbook blog, right? Here it is, the end of October and I haven’t even written about it yet. 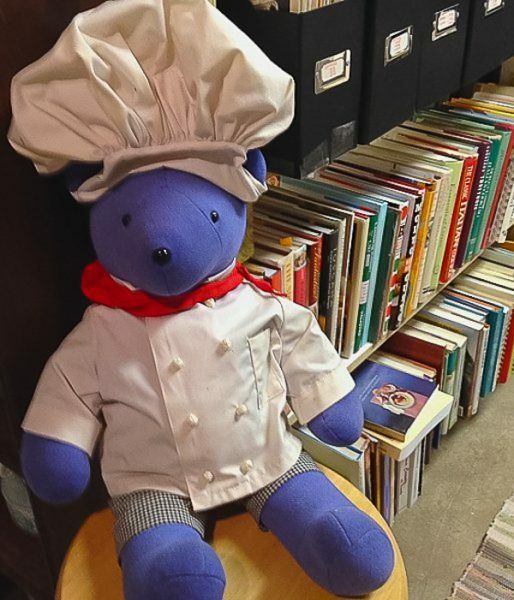 My friend Madonna, who lives in Indiana, and my friend Lisa, who lives in Pennsylvania, both emailed me within an hour of each other last week both asking me, “Did you know it was National Cookbook Month?” and both forwarding the same article. I think those were signs I had better get on the ball before the month ends. Truth is, it has been one of those months where I can’t seem to get a lot done. We are in the process of redecorating the entire upstairs, thanks to my talented friend Mary who is an amazing professional designer. I have a couple of bedrooms that are piled high with bins, various artwork, and lots of “stuff” to sort. 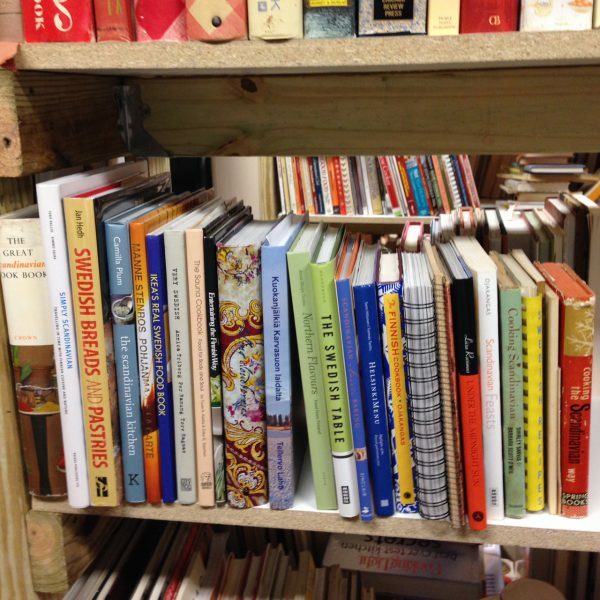 However, no cookbooks, they are (mostly) in my basement, better known as The Culinary Cellar. Entrance to The Culinary Cellar! My beloved cellar has a long way to go before completion, but Mary is going to help me with it after we done with the upstairs. 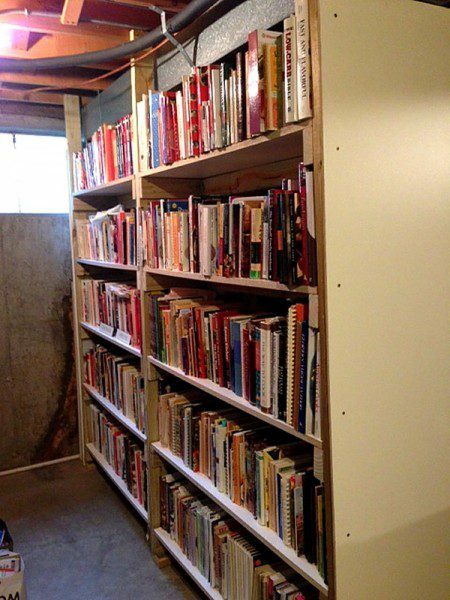 Those of you who follow me already know I had some shelves built a while back by my sister-in-law’s husband, Larry, which meant I could get my cookbooks out of boxes and off those icky metal shelves onto some sturdy wooden ones. Here’s a before and after. 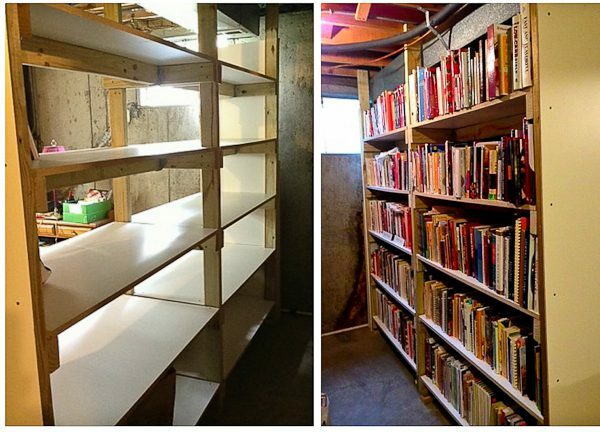 On the left, just after being built, and on the right, filled up on both sides with books back to back like in a real library; and there are three of these. A few of the baking books. 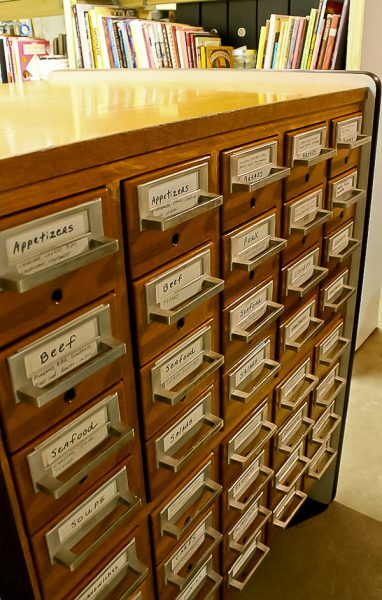 My card catalog of recipe cards! Ha! I wish! 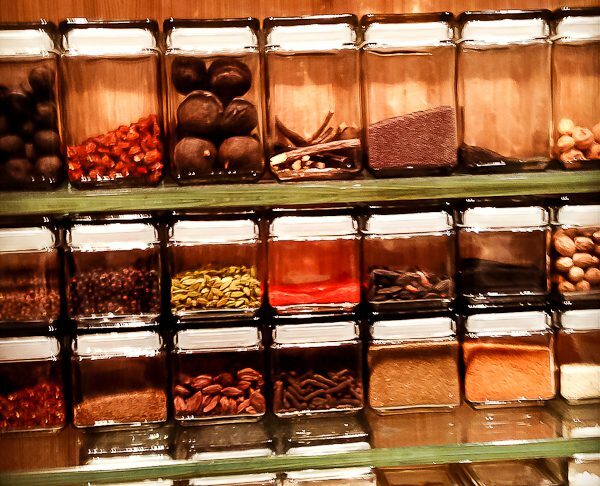 ….This is the Spice Wall at the incredible three Michelin-starred Grace Restaurant in Chicago! 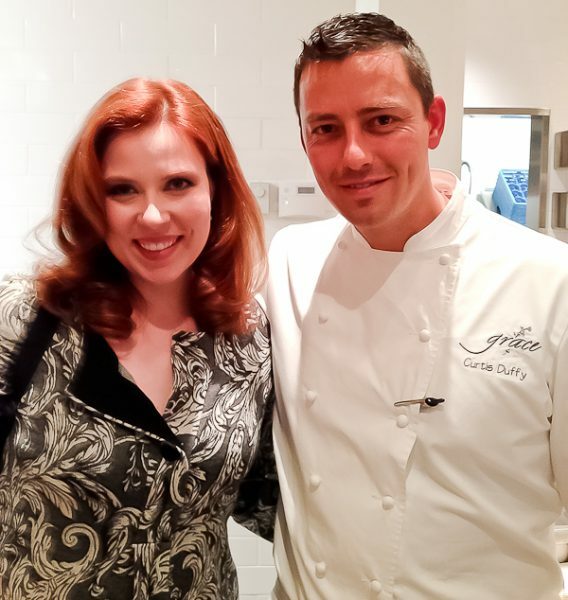 Here is daughter Kristina with Curtis Duffy, chef extraordinaire and owner of Grace. This is also not my wine. ; I took the photo in Tuscany. I thought I would just show you a couple of dream photos of what I would love in my cellar! If you don’t hear from me occasionally in the next month, it’s because I’m either working on the upstairs, sorting out cookbooks, making out Christmas lists, finding new Thanksgiving recipes to try, or for the next day or so, listening to my husband cheer on his beloved Cubs in hopes of a World Series win while he finishes up eating his special Cub Baseball Cake. 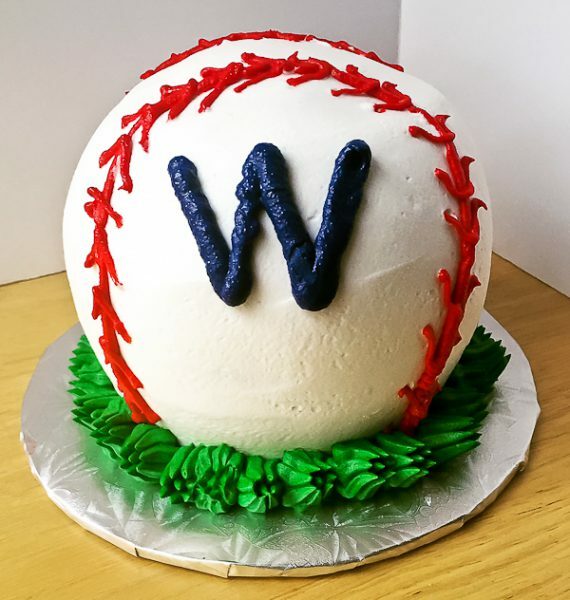 As I am writing this, the Cubs just won Game Five. We’ll see what happens, but after not winning a Series for 108 years, don’t you think it should be their time?! There are more. I just haven’t been to them all yet! 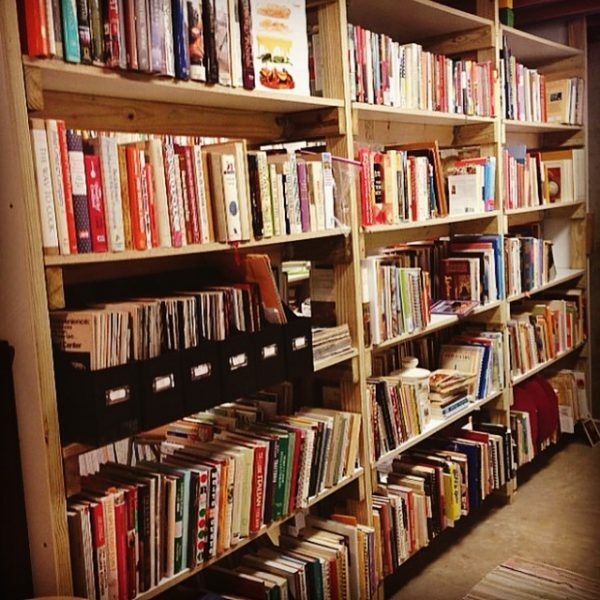 How I would love to come over and spend a weekend with you organizing cookbooks in your Culinary Cellar! It already looks so inviting! How I wish you could too, Kim! We would have a blast! 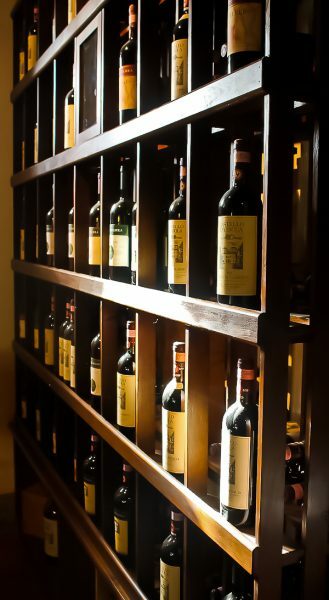 Thank you for welcoming all of us in to the Culinary Cellar…and the many other places you share. Your collection of recipe cards is amazing! It intrigues me to think of the origin of each and the history held in those drawers. I agree with Kim; your cellar would be so much fun to explore! You’re right, Denise, so much history in those drawers. I’m always grateful I found such a great place to store them. One of these days when the cellar is finally completed, I am going to have an Open House and hope you can come! 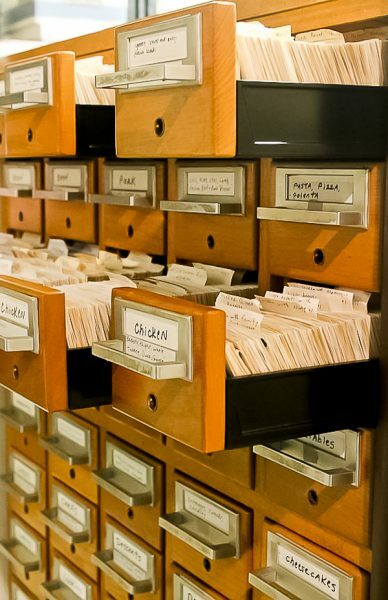 I’m taken right back to my hometown library each time I see a photo of your library card catalog. Love that! It would be a treat to see the CC in person! Our family enjoyed a few days in Chicago last year this time. Count me in! What a glorious time that would be!!! 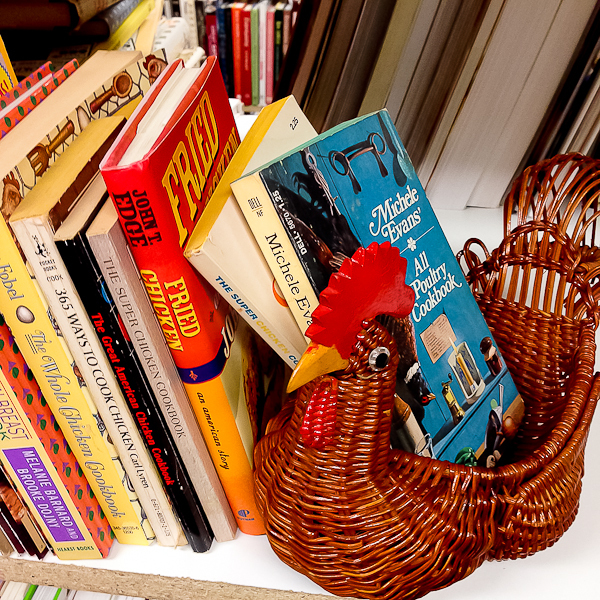 I’m always looking for help to sort all the books! Wish you weren’t so far away.